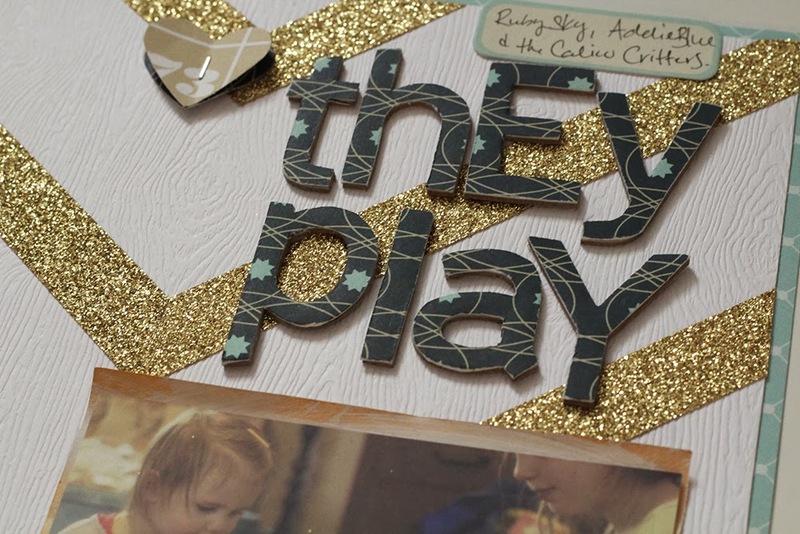 I love bare chipboard pieces -- letters, shapes, whatever! -- because they are so versatile and you can just do so much with them. The December Cocoa Daisy kit Home Again came with a set of chipboard alphabets from Maya Road and I used them a few different ways. 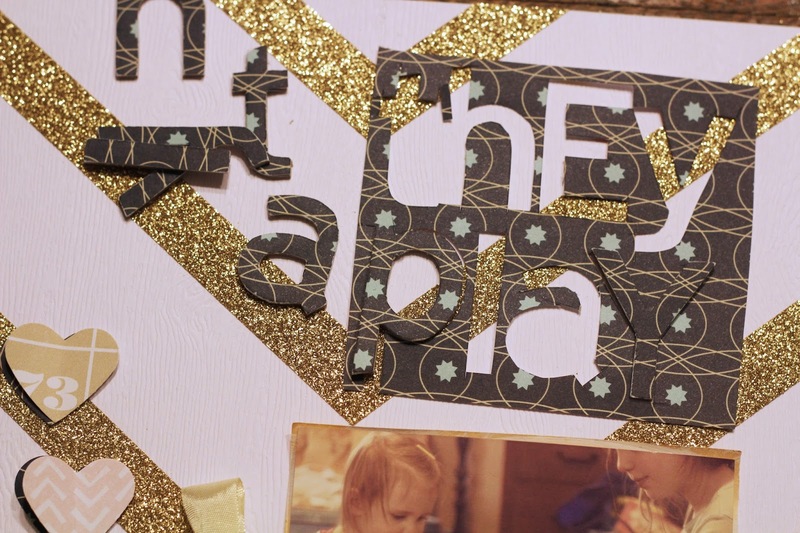 Here are some ways you can DIY chipboard letters! 1. 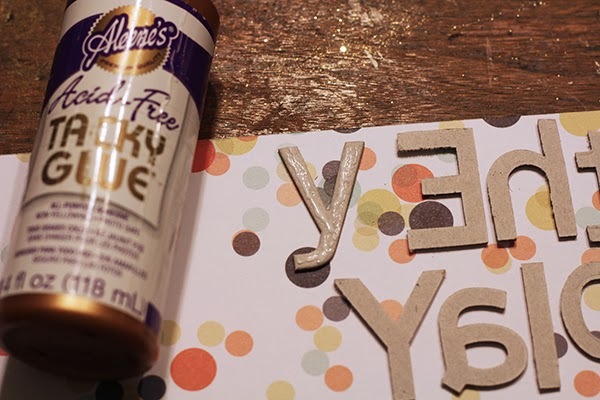 Apply a thick layer of a liquid adhesive like Glossy Accents over the chipboard piece. Be sure to push it right out to the edges! 2. 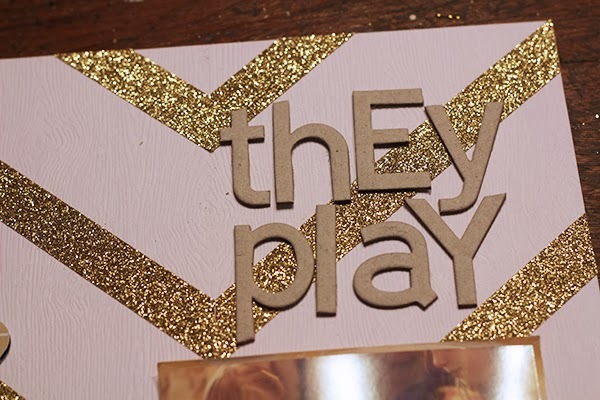 Pour glitter all over the chipboard piece. Make sure to really pile it on there! 3. 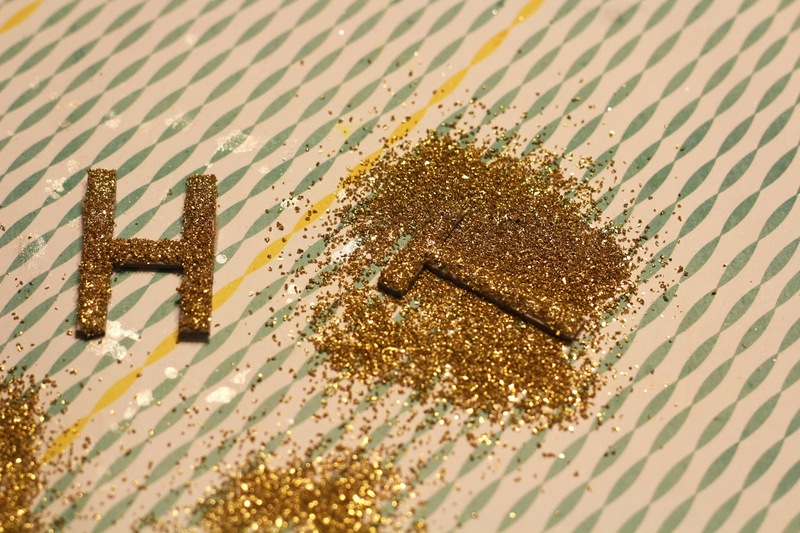 Tap off excess glitter and admire your beautiful glittery letter! I like to use a pair of tweezers for handling the wet piece -- helps me avoid smudging the wet adhesive and glitter. 1. Decide on where you want your letters to go on your layout. This step, and the next one, are really only necessary if you want the pattern in the paper to line up in the letters once they are cut out. 2. Cut piece of patterned paper to fit title. 3. Line up title on patterned paper. Again, this step is only necessary if you want the pattern in the paper to be aligned across the title when you are finished. 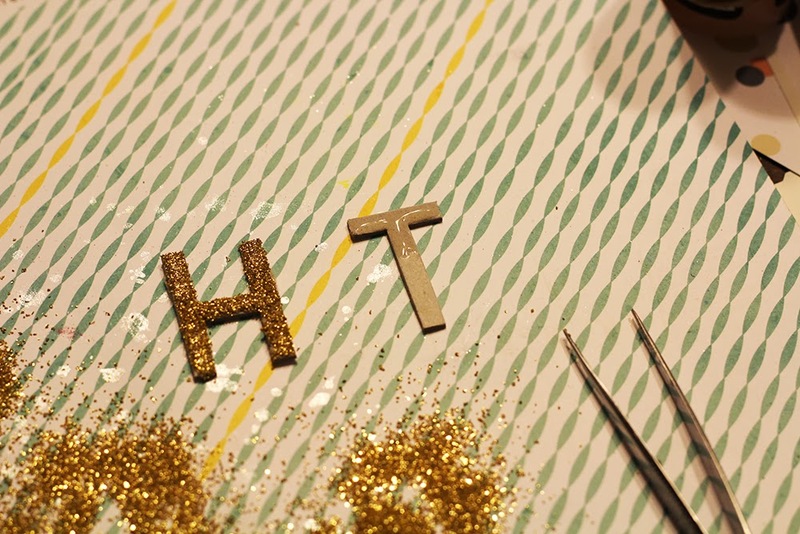 If you are using solid paper or don't want the pattern to be continuous across the letters, you can just glue them to the paper (next step) any which way you like! 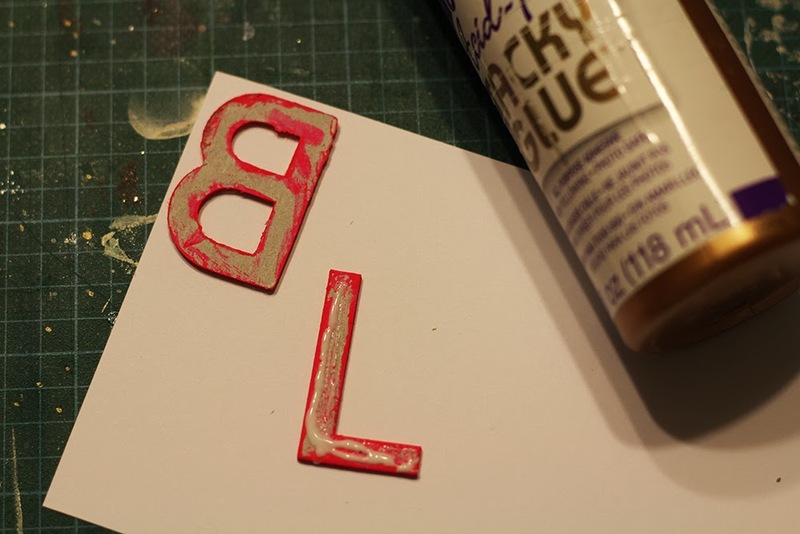 4 Apply a thin layer of wet adhesive to the FRONT side of the letter. I like to use Aileen's (acid free) Tacky Glue. It grabs the paper well, and dries pretty quickly -- but not SO quickly that I don't have time to fuss around with the chipboard and get it in place just so. 5. Once the letters are all adhered, rub over the back of each one with your finger. I give them each a tiny little wiggle from side to side and top to bottom, to help spread the wet adhesive around and make sure the glue is spread right out to the edge. 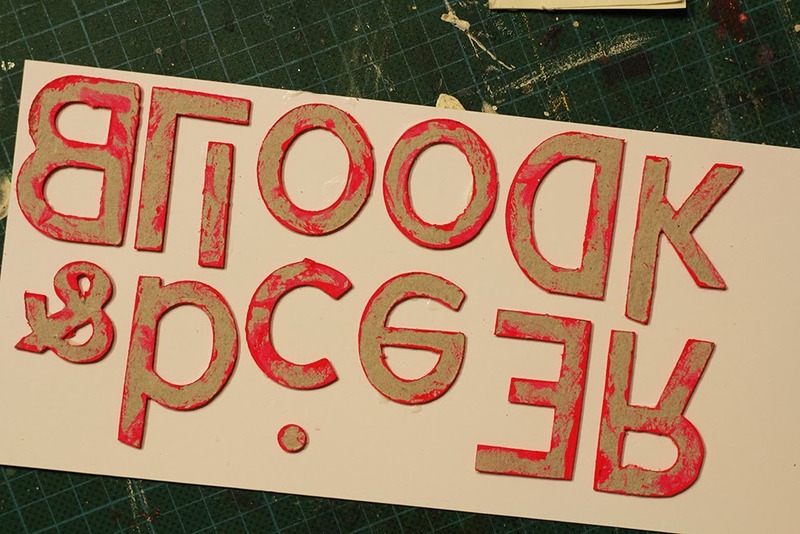 You don't want to use too much adhesive or it will squish out the sides of the letters and make it harder to cut the paper. 6. 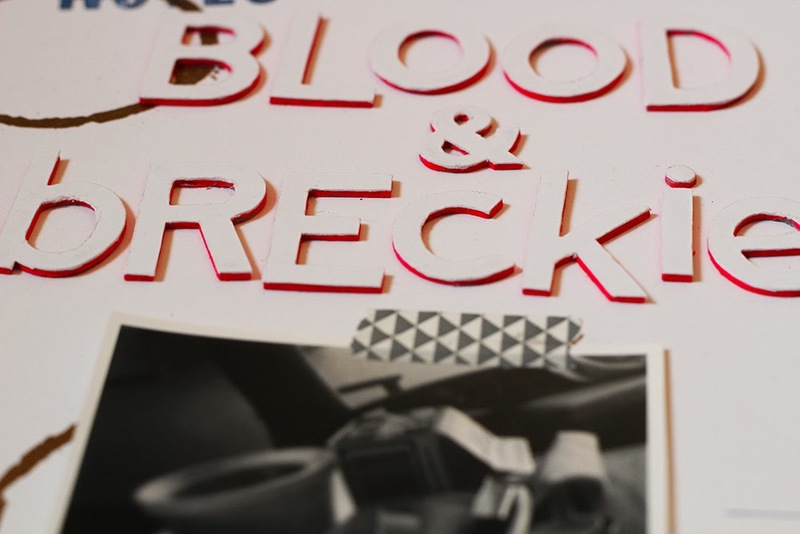 Cut out the letters using a craft knife. I always start with the insides and small curves. Turn the paper as you cut. Once my paper covered pieces are all cut out, I like to use a piece of sand paper (or an emery board works well, too), to gently remove any rough edges, burrs, or little pieces of paper. This makes the final piece smoother and nicer looking. 7. 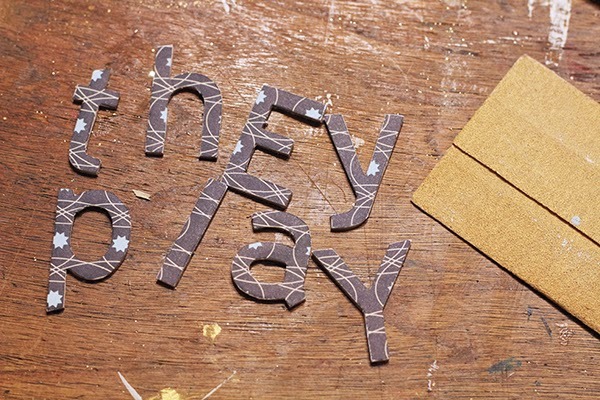 You can use the paper you cut the chipboard out of to help place the letters back on your layout, if you want them lined up exactly so the pattern matches. 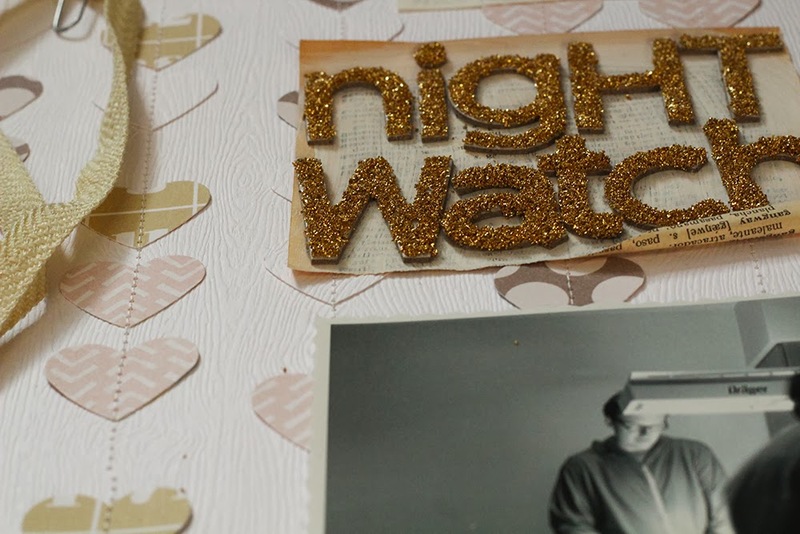 How to give your chipboard a neon edge. 1. 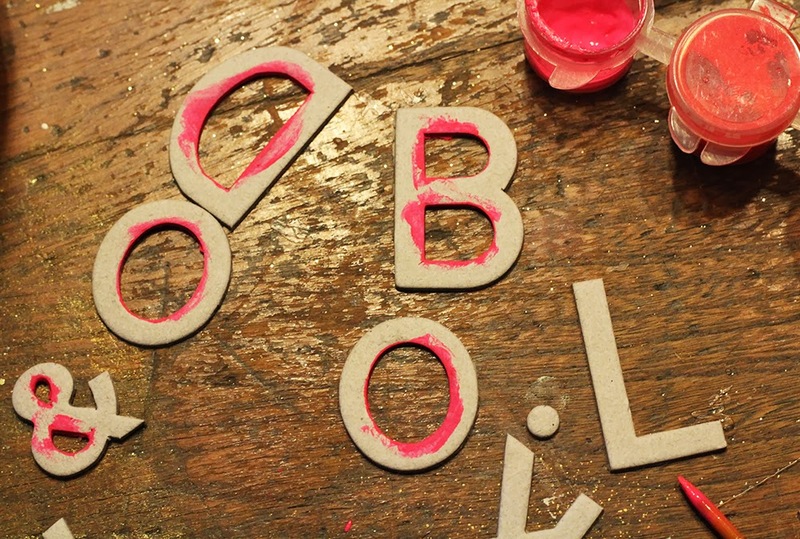 Using a fine tip paint brush, paint just the edges of the chipboard letters. Don't forget to do both the inside edges and outside! 2. 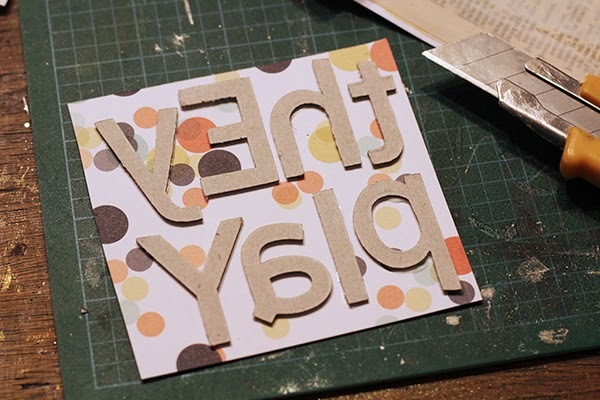 Apply a small amount of wet adhesive like Aileen's Acid Free Tacky glue to the FRONT of the chipboard letter. I squish the letter around a bit when I put it down on the paper instead of smoothing the glue out before. I'm lazy, and don't want to get my fingers or a paintbrush dirty with the adhesive and squishing the letter on the paper a bit works really well. 3. I wanted to use plain white cardstock on the letter fronts, to really make the neon edges pop. 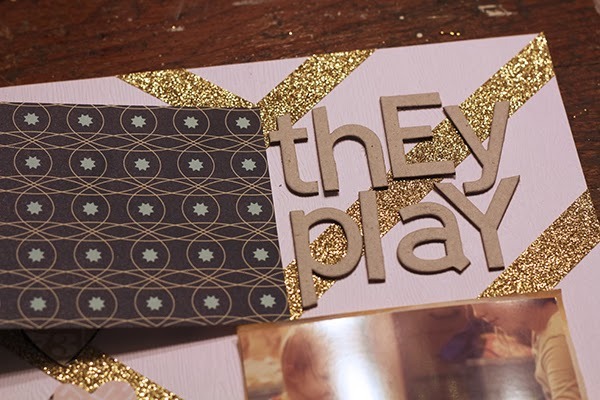 Because I am using a solid colour, I didn't need to worry about the letters matching like with the patterned paper example above, I just glued the letters down randomly. 4. 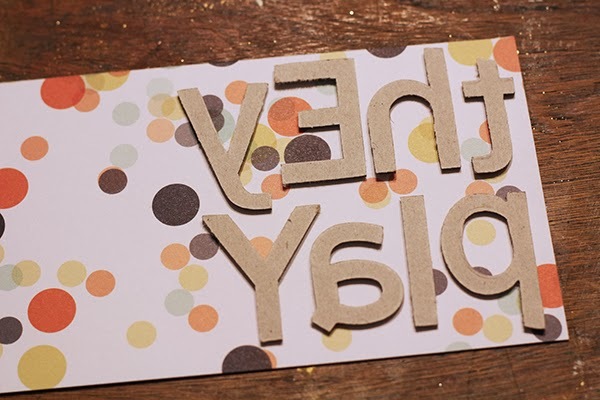 Cut the letters out as shown above with the patterned paper example. Don't forget to sand the edges a bit for that finished look! Great tutorials thanks for sharing. I have been heat embossing my letters a lot more recently. Great ideas. Don't think I'd have the patience for the patterned paper one (!) but will be trying the neon outline idea.....that's why I love your scrapping! All those nifty little touches that add up to a fascinating, captivating, whole...!! Awesome tutorial! Lining up the pattern never occurred to me but it's a fabulous idea. Great ideas and explanations - especially the patterned paper one! Wow!! Great ideas, thank you so much for sharing! Wow, this is a great tutorial! Love, love, love the whole idea of the patterned paper lining up. Never even thought of that! Thanks for sharing!